Character: Tasuki is a bully since he was a kid. He is manly but rude. Ever since he was a kid he already wanted to be the leader of the gang, Thieves of Mt. Leikaku. 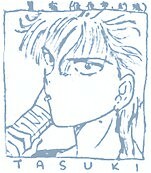 The ex-leader of the gang saw Tasuki as the next leader, and thus taught him the technique of using the Iron Fan. Tasuki appoints Gouji as the temporary leader of the gang when he has to leave for Miaka and the group. He is naive and bad-tempered. He is, too, a very sensitive person who cries and gets shy easily. He hates women since his family is full of women. He is definitely the most manly person among the group.